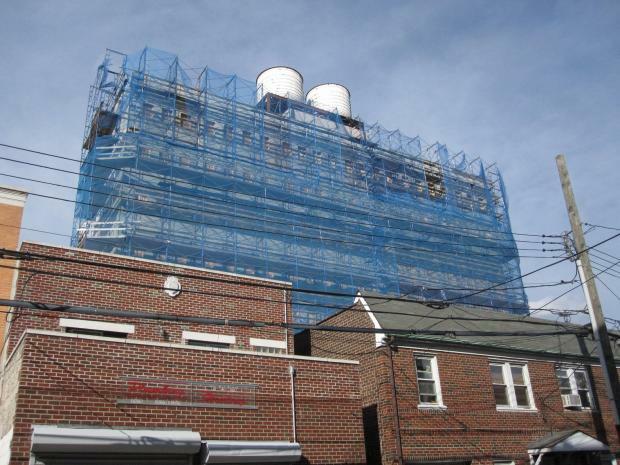 QUEENS — A group of Astoria neighbors says the construction of a massive eight-story medical facility in the neighborhood is putting their buildings on life support and might endanger residents' health. "It will affect our air quality," said Norm Sutaria, whose backyard patio is adjacent to the new building. "It will affect the quiet that we love in our neighborhood and it will affect our property values if it goes forward to completion." A partial stop-work order was issued at the site last summer after neighbors requested the Department of Buildings examine the project. The DOB's audit found that the building was constructed 10 feet closer to the 32nd Street properties than zoning rules allow. But the 32nd Street residents want to ensure the damage caused to their homes is addressed before construction is allowed to continue, saying Pali Realty has been largely unresponsive to their concerns. "The owners have never been willing to talk to us. They wouldn’t even acknowledge us," said neighbor Robert Draghi, who added that the home where he and his family have lived for 12 years will likely need to be torn down due to damage to its foundation. "Getting this variance will just allow them to ignore us." George Magriples, one of the attorneys representing Pali Realty, said claims about damages are in the hands of the insurance companies for the four construction firms involved, and residents should direct their concerns to those agencies. "We've encouraged them to hire an attorney and pursue this claim," he said. At a Community Board 1 meeting last month, representatives for Pali Realty said the developers have invested millions of dollars in the project, which when completed will contain offices for 26 physicians and staff, bringing jobs and medical care to the community, they said. Neighbors say they aren't opposed to the purpose of the site, but instead are frustrated by how the construction was carried out and how the damage to their homes has yet to be addressed. They also want any mechanical equipment planned for the space behind the facility — including exhaust vents for the parking garage, and the air conditioning and heating systems — to be installed on the roof instead of near their yards. "Carbon monoxide is going to be in our backyards," said Germania Imbasa, who has lived on 32nd Street for 12 years. CB1 voted last month in favor of Pali Realty's permit application with some conditions, including that the developers make the "best effort" to settle claims with the property owners, and that the rear of the site be densely planted with foliage to block out noise from any mechanical equipment, according to according to board minutes. But neighbors say that isn't enough. "We have no problem with it being a medical building. We just want to make sure the mechanical equipment is moved," Sutaria said. "We really like Astoria because it's nice and quiet."